Nicolás Suszczyk from Argentina shares how Goldeneye introduced him to James Bond and how he went on to became a collector. January 1998. I saw a billboard announcing the TV premiere of GoldenEye. They used the image of Pierce Brosnan in black tux and the silenced Walther PPK that I immediately reminded me of the Nintendo 64 game of the film. I was amazed at the image of a man so well dressed holding a gun, something not usually seen since most ’90s action heroes worn t-shirts and were all dirty. Bond was debonair, good looking, fancy… and his good manners extended to the way he held the gun! I saw GoldenEye with my parents (my dad briefly explained who James Bond was) on January 31st, 1998, at 14:45. I was totally hooked up: Pierce Brosnan brilliantly playing agent 007, Famke Janssen as the lethal and gorgeous Xenia who gave the then seven year old kid an instant crush, Alec Trevelyan as the treacherous 006, the bungee jump, the tank chase… in the same way people were hooked up by Thunderball or Goldfinger in the 1960s, I was captured by GoldenEye in the 1990s. Shortly after, I watched Tomorrow Never Dies on the big screen (released in my country in January 1998) and I loved it too. Then I started buying magazines, CDs, action figures, etc. And that was my transition from Bond fan to Bond fan and collector. It’s a really hard question because there are many. And more than the value of the object I consider another value: the person behind it. 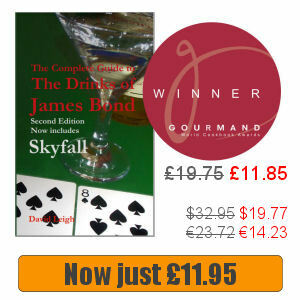 Each Bond memory and each Bond collectable often relates to the person who gave it to me. To name a few, there are the VHS tapes my dad bought me (The Man with the Golden Gun was the first), lots of gifts from my friend Pat Carbajal like the novel Casino Royale, the book he gave me as a birthday gift when I was 13 because I was looking forward to read it; and many items given by retail employees, like small standees, posters and other rarities. There are also things I got thanks to my friends from abroad (namely the SPECTRE soundtrack and DVD that weren’t released in my country). 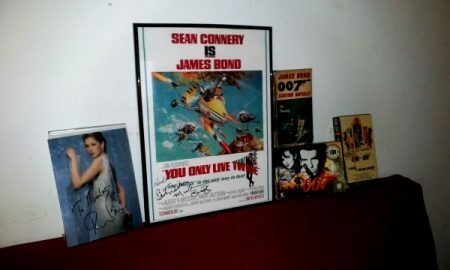 If I had to name “important” things, I’d go for the autographs: there’s a You Only Live Twice miniposter signed by Michael G Wilson & Barbara Broccoli that I won on a Twitter contest, my A View To a Kill cassette and LP soundtrack signed by Simon Le Bon and Roger Taylor when Duran Duran came to Buenos Aires in 2005, and some stills signed and dedicated (Judi Dench, Rosamund Pike, Naomie Harris) that reached me thanks to a very special person in my life. Oh, there’s also the GoldenEye 007 game for Nintendo 64. The coveted prize from my childhood that I have now as an important part of my collection. I bought it myself, but even in the era of the Next Gen consoles I felt it was a debt with the 8 year old kid I have inside. In the end, every Bond collectable is related to a place, a person or a time in my life. That’s for me the real value. So many Bond things of the 1990s. I’m very nostalgic and I was a little kid when the Brosnan films were released, so I didn’t take collecting very seriously. Everytime I see GoldenEye or Tomorrow Never Dies memorabilia it gives me a pinch of excitement. Same with The World is not Enough and Die Another Day. Of course, in the end it happens me with every single Bond film, but just by googling rare stuff I came across with things of the Brosnan era and makes me wish to have a cathedral full of these stuff I didn’t have the interest to get as a kid. If you tell me a specific item, I’d go for the 1996 GoldenEye Pinball by Sega and a hanging display with the images of Bond, Natalya and Xenia that I once saw in a video store and I never saw again. I’d also want to own the basic things: the Bond soundtracks I can’t find and the full John Gardner and Raymond Benson novels that weren’t released in Argentina or are out of stock. By being born and still living in Argentina there are many. First of all, many of the Bond stuff weren’t released here: action figures, miniature cars, even BluRays, DVDs or soundtracks! (SPECTRE wasn’t released in any home video format here!). On the other hand, there’s a big import restriction that stupidly holds in custom the things you can buy abroad, altough is being regularized lately, so sometimes I don’t dare to buy and I opt to do exchange with other fellow Bondians abroad. I have to thank many friends for their generosity and for accepting my stuff in exchange or for having the kindness of getting me collectables just as a gift, like Reuben Wakeman and Shane McCoy. After all that, there are more basic things: my room is very small so I get into the dilemma of having stuff and reorganizing everything very often. As I found some new John Gardner Bond novels I had to “hide” Carte Blanche and Solo. I’ll still have to see how I’ll manage when a friend sends me Trigger Mortis! In a very small space is very hard to keep everything and store it in a way everybody sees it. Of course, there’s the money thing too: an Argentine peso worths around 15 dollars, so a little trinket I could get on eBay for $0.01 would cost me a fortune including shipping! I love collecting newspaper and magazine scraps. I continued the research a friend of me, Adrián, did some years ago by identifying all the James Bond related reviews, articles and ads in Argentine newspaper and magazines. 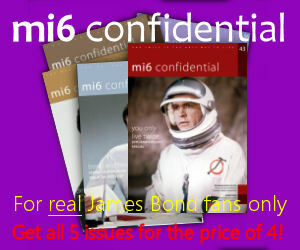 As I’m very nostalgic, I still like getting old Bond VHS or DVDs, particularly the first editions. Another friend of mine sold me the 1997 GoldenEye DVD (clipcase packaging) for some pesos years ago and I don’t regret getting it even if there are no extras! On the other hand, unlike many of my friends, I’d still keep buying phyisical stuff even when digital movies and books are trending. I don’t have a movie until I got it on DVD or BluRay (well, I don’t have a BD player yet) even if the downloaded version has a better resolution. I don’t have a book or a comic until it’s stored in my shelf. Digital stuff don’t count too much for me. There’s my personal Twitter account and there are also my two sites: one dedicated to my favourite Bond film, called The GoldenEye Dossier and another one called Bond En Argentina, where I publish rarities I found in my research like magazine and newspaper ads. The latter it’s in Spanish, but sometimes I manage to translate some sections.